I don't wear these Prada booties very often for a couple of reasons. For one, I'm afraid of damaging them. I'm not used to wearing nice things! Secondly, they're terribly uncomfortable. When I do wear them, it always feels special, and I get lots of comments. I like how they add some glamour to this otherwise casual, rugged look. On an unrelated note, Halloween is almost here! Are you guys getting excited? I absolutely adore Halloween and can't wait to dress up. wow those shoes are certainly amazing. The outfit is very cool and chic. I can't wait to do a spin-off of this outfit! 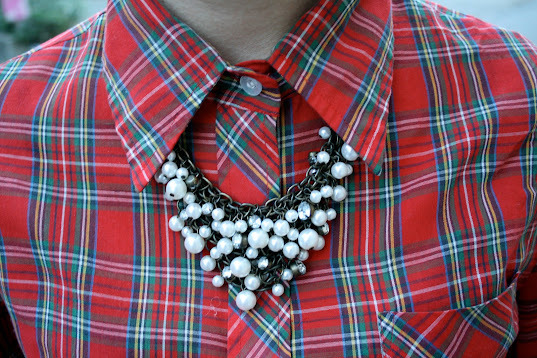 Except I only have a black and white lumberjack shirt. Oh well! Those boots are amazing. I'm just thinking I have all the elements to wear this outfit myself and I still need to get dressed today, hmmmm. . . I love your hair today! It look naturally windblown. Awesome shoes-- I would be so scared of damaging them too. those boots are so fabulous! leave it to you to style them so naturally! I love the juxtaposition of the super glam boots/necklace and the much more casual top. Totally inspirational! I'm trying to figure out how to make it my own. THOSE BOOTS ARE THE MOST AMAZING IVE SEEN IN A LONG TIME!!!! SO SO SO SO JEALOUS!! the shoes are beautiful, so much so that I would probably wear them sparingly myself. i loooooove this look!!! i haven't seen you wear the shoes since the style challenge way back when. they look awesome!!! and so does your hair! I really like the plaid button down with the extra girly necklace! Well, even though they are uncomfortable, they do add a sense of glamour to the outfit (which I LOVE, by the way)! 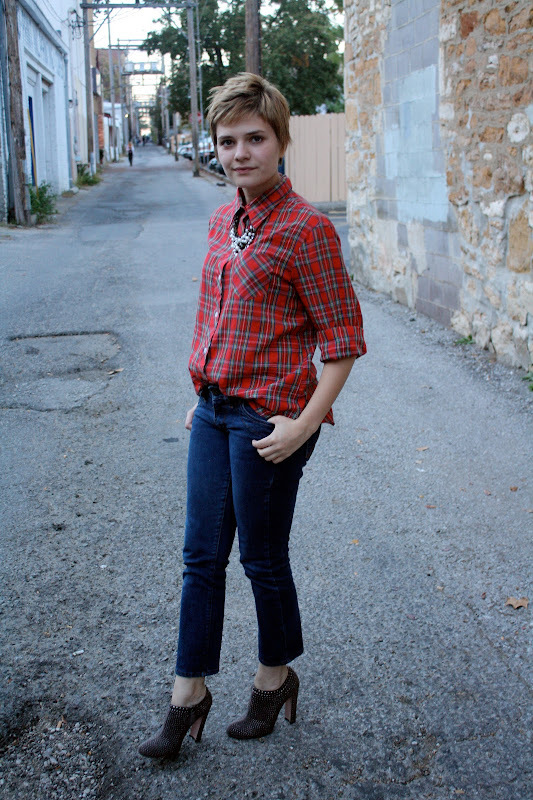 PERFECT plaid shirt! I love it! Your hair looks extra-cute in these pics. And too bad the shoes aren't more comfortable! They're cool! Great shoes, you look adorable in this outfit!! !